A #Guide where you can find tips and trick for many different things. Let us #Help you. A foot rest is designed to maintain your feet supported and comfortable while you are sitting. Although it is commonly overviewed as an important ergonomic accessory, it provides significant ergonomic benefits such as easing leg problems and lessen lower back issues. Without proper support of activity, your feet impact your legs, your circulation, your back, and other areas of your body. Problems in any of these areas are known as the main reasons for loss of productivity in workplaces. Maintaining correct posture is important and for that you need to keep your hips slightly higher that your knees. Plus, you shouldn’t keep your feet flat on the floor but move then around often. Using a foot rest will help you keep your feet in a proper position hence alleviating the pressure on the back of the legs. Choose a footrest that is adjustable and offer support for the entire foot. Sitting or lying for long periods of time with no activity can cause poor blood circulation. 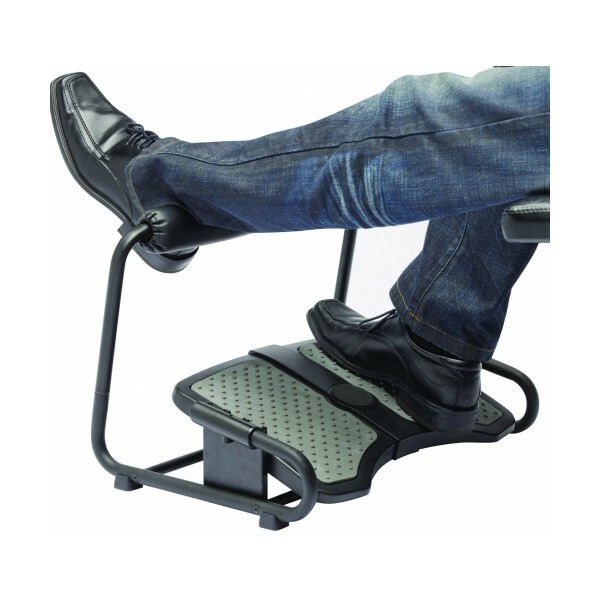 Maintaining your feet up on an ergonomic foot rest minimizes your chances of developing circulatory problems. Moreover, you should change your position as much as you can by adjusting your hips, lifting your arms, moving your feet and simply slightly changing your posture regularly during your work day. Frequent breaks are also important, 10 minutes every hour are the recommended time. Sitting for too long in an office chair with your feet improperly positioned will lead strains on your spine. A foot rest help you to sit properly (all the way back) in the chair while keeping the correct ergonomic angles and reducing pressure on your spine and back region. Moreover, the use of the footrest significant elevate the point of contact with the back support and sitting slightly reclined eases muscle activity around the spine. All these benefits are achieved when you simply use a foot rest. Size – Big foot rests offer more choice of leg posture. Stability – Foot rests must be stable enough to stay in place. Mobility – Foot rest must be mobile enough so they can be moved by the feet when needed. Height and Angle Adjustment – So you can adjust the foot rest according to your personal needs.